With our new eMedia Catalog, the procedure for checking eBooks and eAudio Books out has changed along with adding new features, so we have updated our eBook Downloading 101 – 2013 workbook. These directions are for all devices with the exception of iOS devices. iPad, iPhone, iPod users need to continue to use the eBook Downloading for iOS Devices. In addition, this week we will have a new log in method. You will no longer need to select the Library District. You will just enter your Library Card number and zip code. We hope this makes it easier to access your eMedia Account especially on mobile devices. 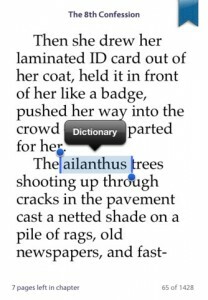 The latest version of OverDrive Media Console for iOS devices gives readers fingertip access to dictionary definitions. This morning, OverDrive launched OMC for iOS version 2.4.1. This updated OverDrive Media Console app for iPhone and iPad users includes a dictionary look-up feature with Wikipedia integration, several bug fixes and other performance improvements to make the eReading experience even better. If you have a previous version of OMC for iOS on your device, you should see the update appear in your App Store shortly—if not already. New users can download the app from the Apple App Store. The new OMC for iOS app is more functional and intuitive than ever before, streamlining the experience for iPhone and iPad users. You’ll find the dictionary look-up feature especially convenient: Just tap a word with your finger to find the definition. You can also navigate to the corresponding Wikipedia page for more information. eBook Readers are hot! Are you looking to buy one soon? Do you want to be able to get eBooks from the library for free? Did you know not all ebook readers work with library ebooks? For the latest updates to what works visit Compatible eBook Devices. Short version of which eBook Readers work with Library eBooks includes information about the new Apps for iPhone, iTouch and iPad. Join me March 8 at 10:30am to Noon at the Centennial Hills Library for a lively discussion on getting started with eBook Readers and eBooks. 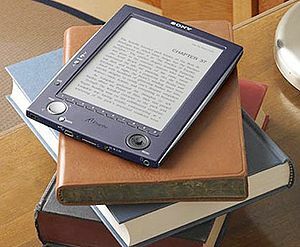 When you get your ebook reader, open it, and need help visit eRead Me Vegas – FAQS, Tips & Tricks. Remember the eMedia Catalog where you can download eBooks is open 24/7/365 days! OverDrive has released an update to the OverDrive apps for iPhone and Android, which adds support for eBooks from the eMedia Catalog. Now you will be able to download both EPUB eBooks and MP3 audiobooks directly to your iPhone, iPod touch, or Android phone/tablet. New users can search for “OverDrive Media Console” in the Apple App Store and Android Market, while current users will be alerted to update the existing OverDrive app on their devices. OverDrive Media Console v2.0 for iPhone and Android provides two major enhancements that improve the end user experience. First, the apps now enable users to download and enjoy EPUB eBooks on their devices (in addition to the existing ability to download MP3 audiobooks). The eBook reading experience includes user-inspired features for bookmarking and adjusting brightness and font size. Additional features will be added as the apps develop, including highlighting, annotation, in-app text-to-speech, and more. Second, both apps offer a built-in ‘Get Books’ feature. If a you have already downloaded audiobooks from our eMedia Catalog with a previous version of the app, you will be able to access our eMedia Catalog when you select ‘Get Books’ just by entering Las Vegas. If you are new to library downloads, you can quickly find our eMedia Catalog website and save it for single-click access going forward. Once there you can browse the eMedia Catalog on your device, check out a title with your library card, and wirelessly download an EPUB eBook to the app. All this without connecting to a computer! Even with the release of OverDrive’s apps for iPhone and Android, we know that there are additional requests to support other devices, including iPad. Currently the iPhone app will work on iPad with iOS 4 and enables the full browse, check out, download experience. However, an optimized version for iPad—with improved resolution and additional features—is coming soon, along with apps for BlackBerry and other mobile devices. For more information on OverDrive’s apps with eBook support, visit the software page on OverDrive.com. Looking to buy an eBook Reader this holiday season? Do you want to be able to get eBooks from the library for free? Did you know not all ebook readers work with library ebooks? To find out which ebook readers work read our holiday Ebook Reader Comparsion Chart Revised February 2011, How to Get Started with eBook Readers and eBooks and ourBuying Guide rev 2_2011. For the latest updates to what works visit Compatible eBook Devices. 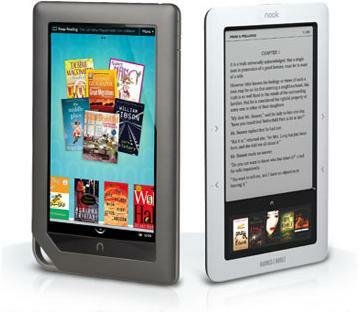 Note: Nook Color and Literati Reader by Sharper Image have just been added to the list of compatible devices. When you open your eBook Reader on Christmas Day, visit the eMedia Catalog and download eBooks! We are open 24/7/365 days!